Let me start this last day in June...and...the halfway mark of 2013...with a purchase :(! I'll be using it up pretty quickly though... As a matter of fact I've already used all of the greens and neutrals on Kaskade :)! I'm busy putting the pieces together. 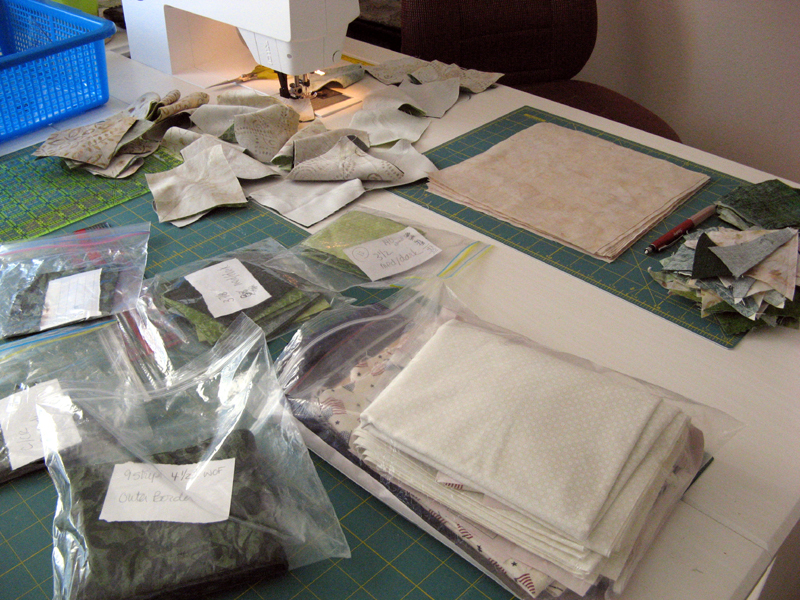 A little more each time I find myself in my sewing room. 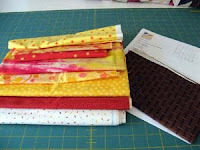 As with many projects one needs to purchase some fabrics to complete them. I am going to love Kaskade, but it may have been more of a reduction to my stash if it had been made with a different shade of neutral and blues or blacks/grays. Oh well I'm sure another project will come that will help me reduce those two stash containers. I ran into a shortness of fabrics working on Kerry's patriotic project. That has been rectified so I will get to working on it again. I promised a finish for Independence Day which is what I plan to accomplish. 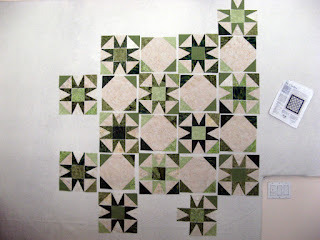 There are other projects going on that I will share progress on tomorrow on my Design Wall post with Patchwork Times. I'm anxious to see the Thirteen in 2013 Parade today with Aunt Marti. Mine is Kloudburst. I selected both thread and quilting pattern at Kerry's Quilting on Friday. 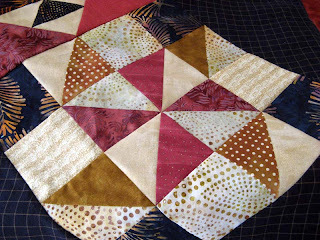 Gold thread and a design called Twirly Feathers. I'll be anxious to see how it turns out. Monday Aunt Marti will announce the July UFO...excited! I found time to sort out the HST Swap on Saturday. The participants packages are either in the mail or in my trunk. Liz has already been to pick hers up. I hope to get to El Cajon Library at noon today for a little Opportunity Quilt for Sunshine sewing. Perhaps there will be others in attendance who will claim their package. So for today I have 7 quarter yard and 4 half yard pieces to bring up my purchase status. Nothing to claim, but come next Sunday Kaskade just might change my Net for 2013! See other quilters using their stash through the links at Patchwork Times. Here is where I start this morning on Kaskade. This is as far as I can go without more background. Bonnie's fabric just wasn't quite right... I stopped by Bits and Pieces in Poway on my way home yesterday and did pick up a FQ that works. It really isn't what I wanted but the color worked. If going to a couple other LQS between later today and tomorrow don't have what I need I'll be back to Bits and Pieces. 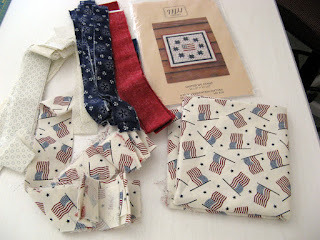 This is the project I'll work on today (PJ Day =^.^=). I've already made this, but now I'll make up Kerry's project which she has been delayed on for other projects. My hope is to give it to her tomorrow. It is all cut and ready to assemble. A small project that I'm pretty comfortable I can finish. The last swapper's HSTs arrived just now. Looking for dividing them all out and shipping them off this weekend. 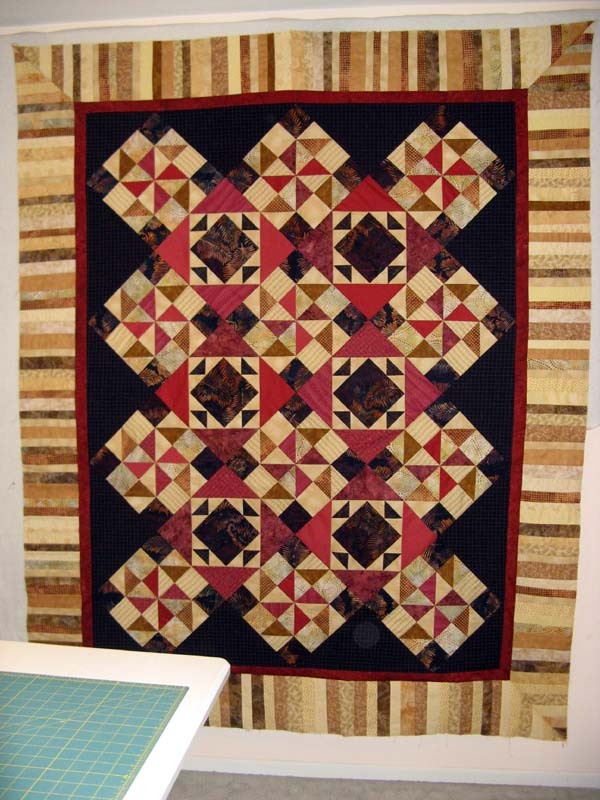 Any of you participating swappers looking for a HST project to work on during the Independence Holiday? They'll be ready for you. Just a little bit of progress on Kaskade last night. 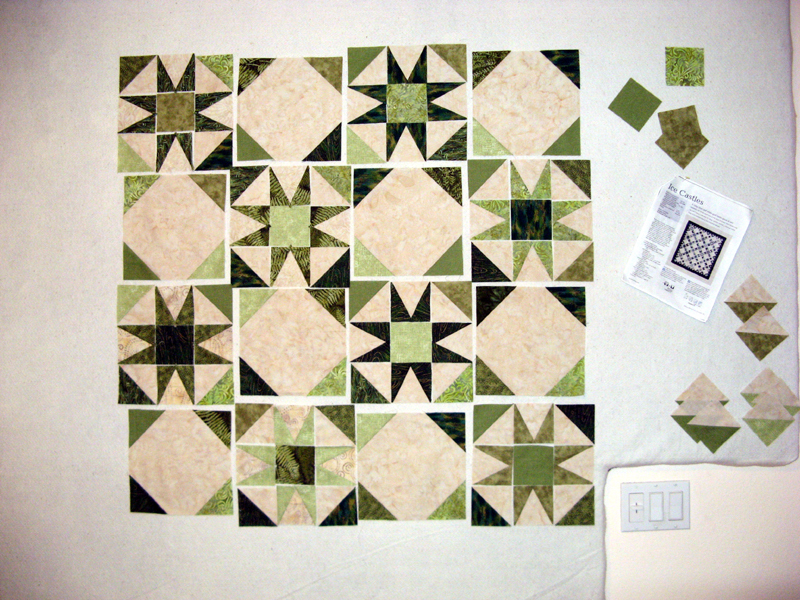 Another eight blocks done. I used up what neutrals I could find in my stash. Bonnie is going to bring in a fabric tomorrow that might work. Aren't friends the best? I'm planning a stop at Bits and Pieces in Poway on my way home from work tomorrow too. Hope you find time in your sewing room today! 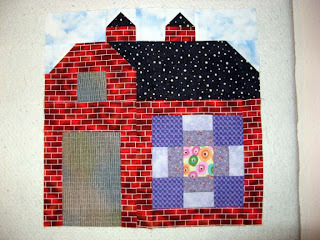 See more inspirational projects today through the links at Patchwork Times. 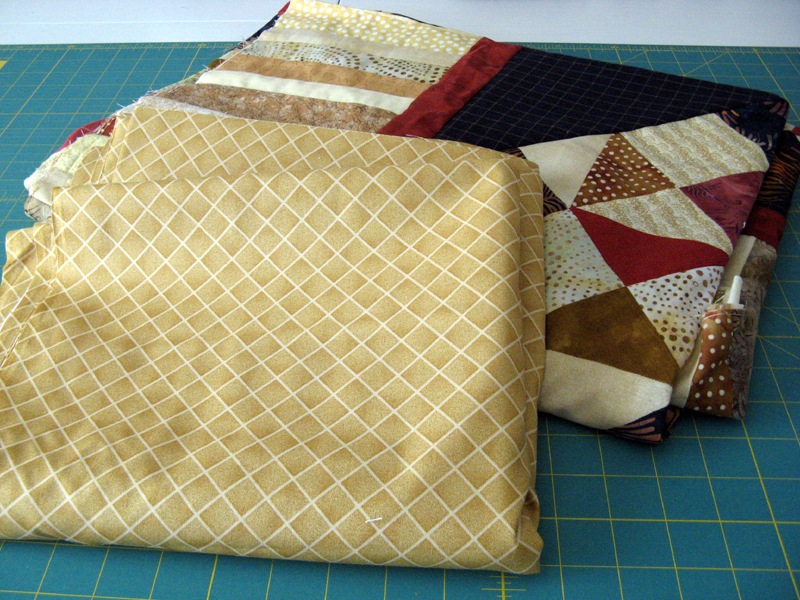 I have two small quilts to claim as used today. Both are for the Moore, OK 1st/2nd graders who will celebrate the opening of their new school with an ice cream social. 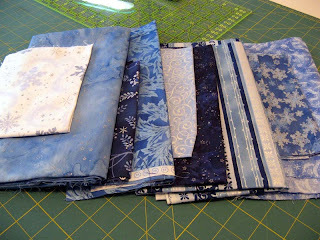 I purchased 5.75 yards of fabric at Memory Lane, but have already used it so I won't take time to add and subtract. The big piece is for the back of Kloudburst and the other .75 yards is going towards the extra blocks to make Kilowatts larger. I was "quilt retreating" this weekend with eight others. 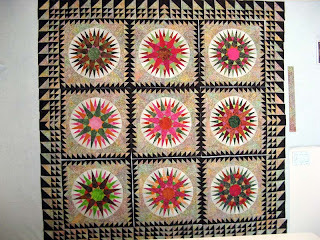 So much fun to spend time with my quilting sisters. 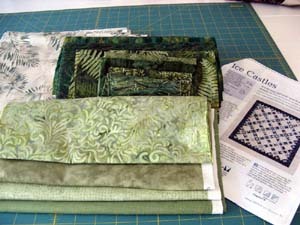 I worked on four projects, two of those were the ice cream quilts. Kilowatts saw a little bit of work...not much. The last project was Kaskade. 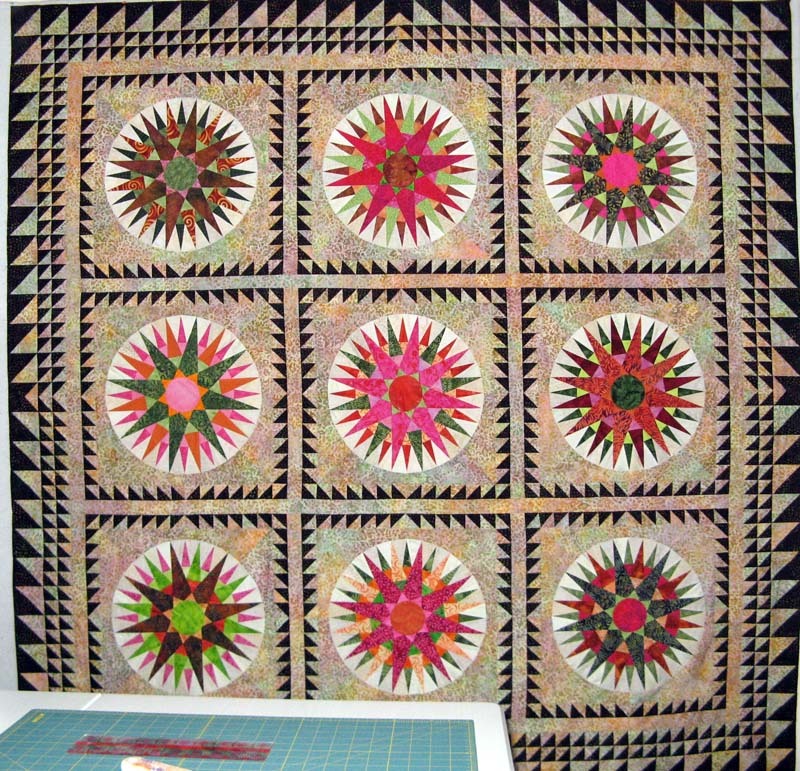 I changed my mind on the background and didn't have enough of the fabrics I decided on to work much on it. 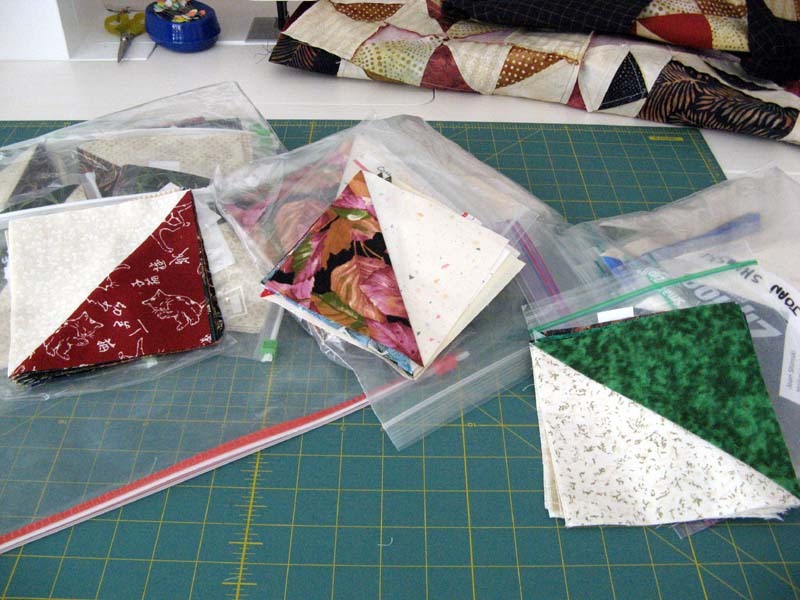 Today was the turn in day for the HST Swap that I've been coordinating. I got six swappers blocks. 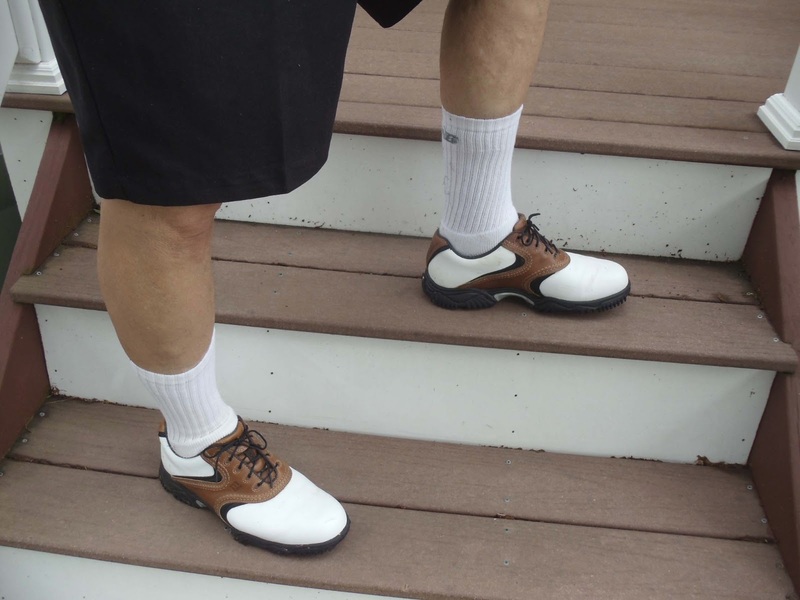 Here's a sampling of what came from Susie, Collette, Joan, Liz, Kerry and Debra. I have one yet to get and I'll be working to divvy them up and send them to everyone. 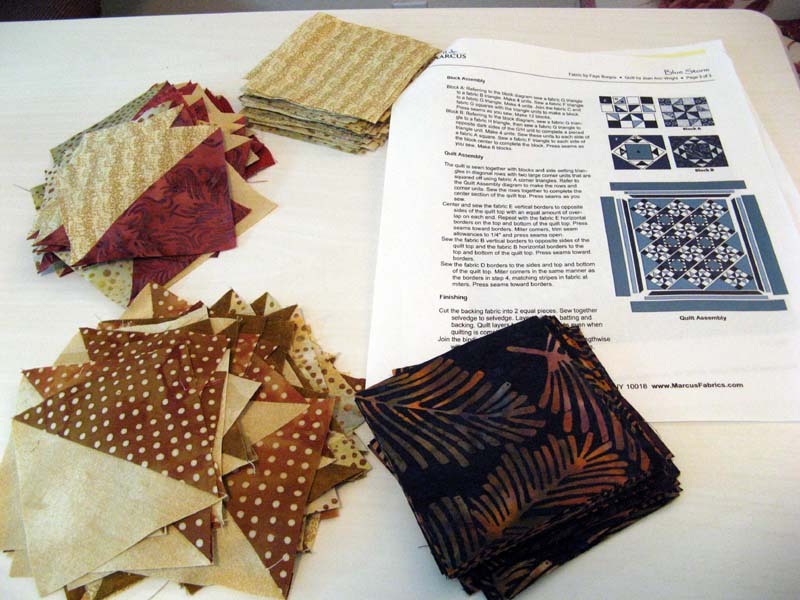 There are more quilters using their fabrics...or purchasing more for projects that they are inspired to make. 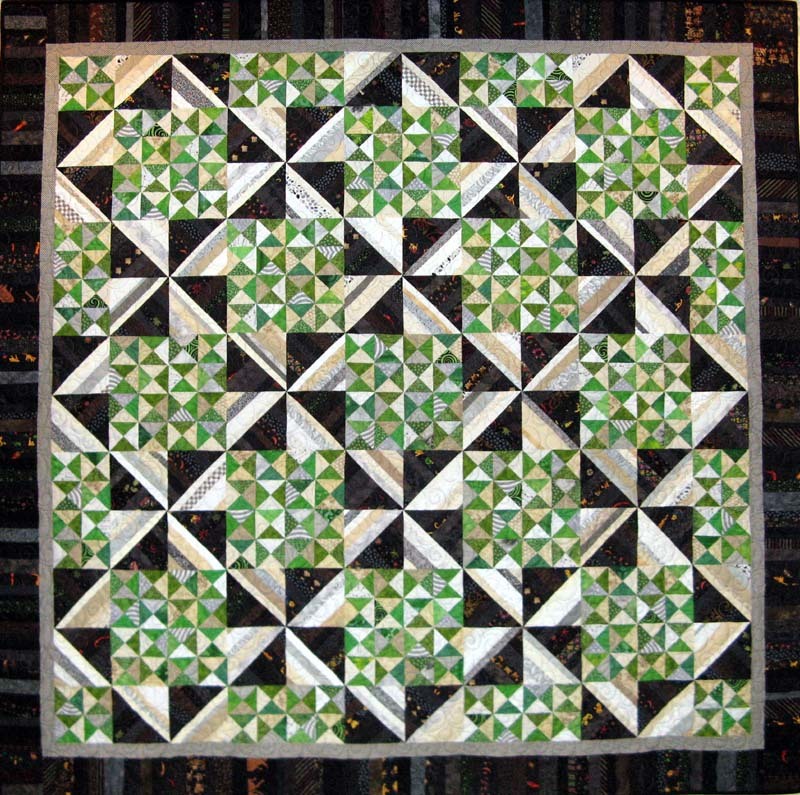 See the several links at Patchwork Times. Enjoy your Sunday! Except for the label Khambray is done. 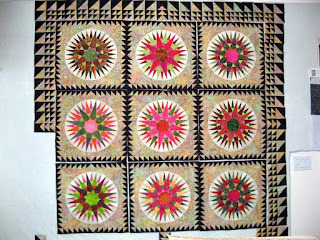 I sure love this design by Cathy Wierzbicki from her Geometric Gems book called Pineapple Nine Patch. Diamond Dust another design in her book intrigues me too... Khambray is all from stash and was a 2013 UFO from earlier this year. 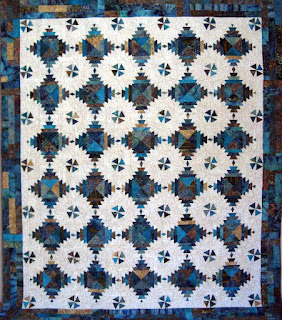 The quilting is awesome; not that I'd ever expect less from Kerry. Thanks Bets on pointing out my OOPS! on Kloudburst. I hope that I would have caught it when I was pressing, but you sure helped out a bunch with your comment. 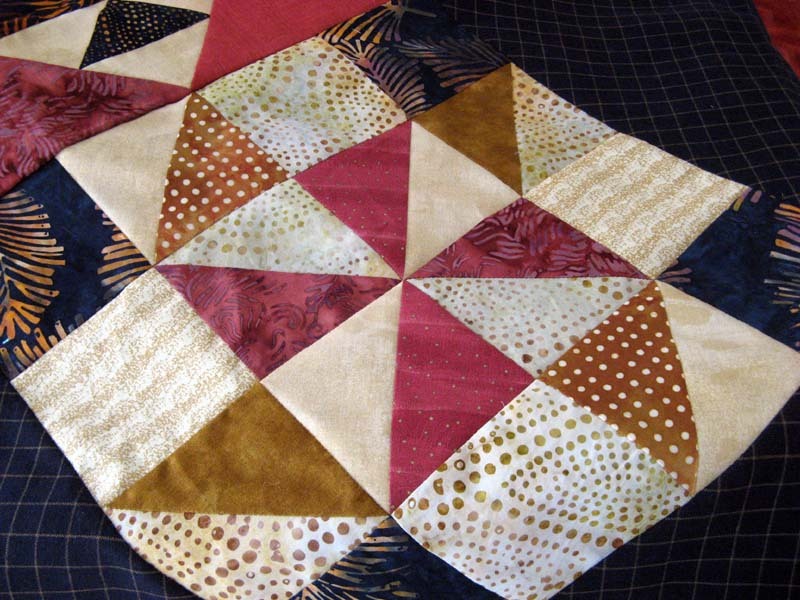 That top right gold/background HST is definitely rotated wrong. Points to the center a must!!! Nothing on my design wall today. Projects finished that were there. 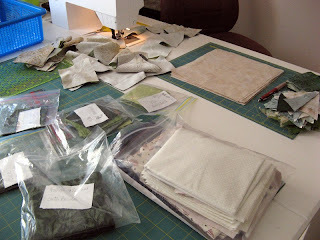 It's on to cutting the next project. There are two I'll be working on Kaskade (yet another 2011 UFO to complete) and ice cream quilt #2 for the Moore, OK kids. Have you been involved with the Ice Cream Social for the 1st/2nd graders? For more information on this worthy cause leave a comment and I'll provide details. 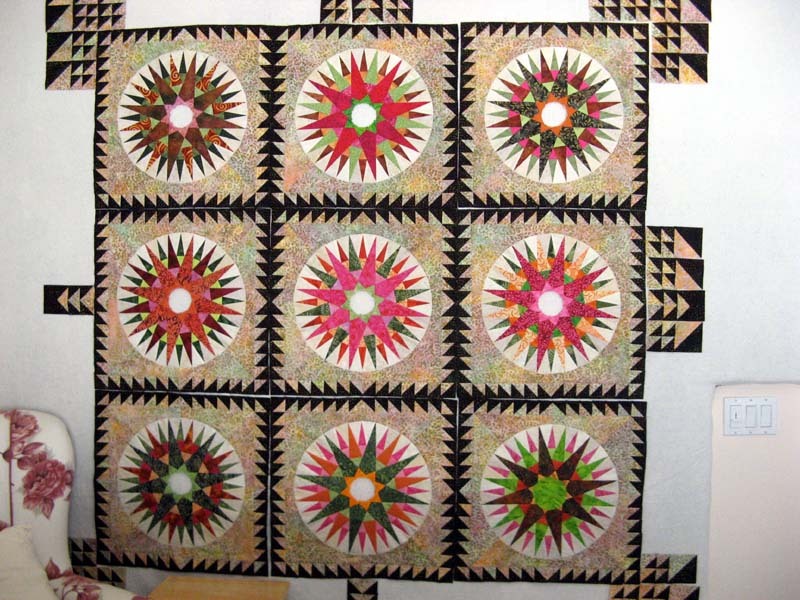 Canyon Quilt Guild meets tonight. I'll be back in my sewing room Tuesday night. Have fun creating this week! I have a finish YIPPEE to report. Kloudburst is done! 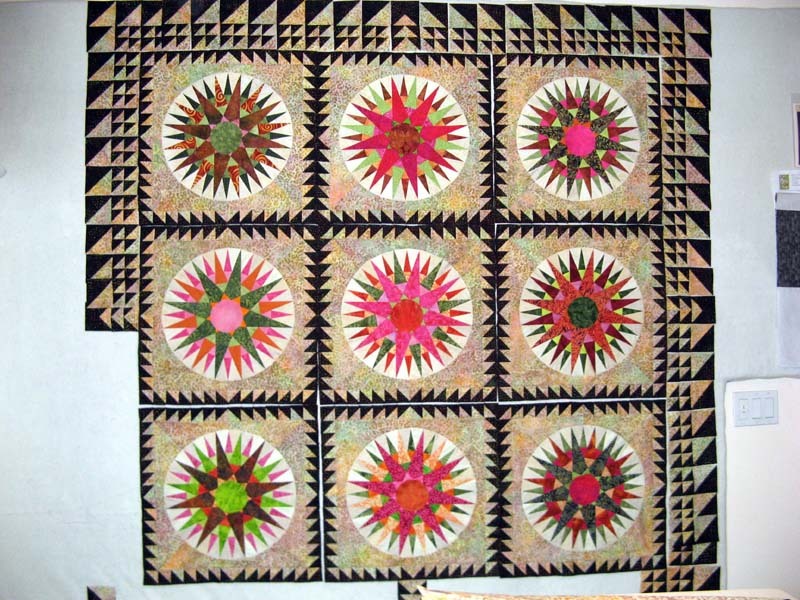 Kloudburst is my June 2013 UFO #9 with 52Quilts.com. Oh is it satisfying to have a completion... I did have to beef up my purchased stats a bit to finish it, but only by a 1/2 yard. 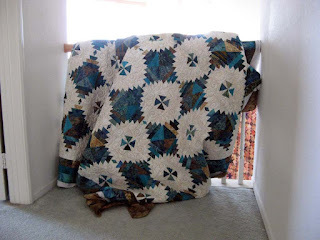 The inner border just wasn't to be had in my stash. 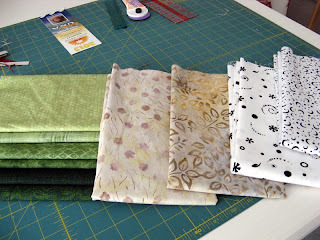 Since I was at Beverlys finding the right fabric for Kloudburst; my next project Kaskade needed some medium greens. Well you may remember that I've been using my green stash lately hence medium greens are not among fabrics in my green tote... Another purchase, but these 1/2 yard pieces will be used up real soon. Sometimes you just have to purchase to use your stash. This was one of those times. Last up are the fabrics for the second Ice Cream quilt for the 1st/2nd graders of Moore, OK. 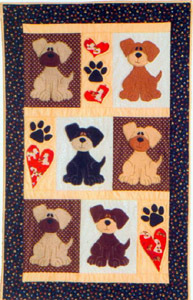 I'm going to use the Project Linus pattern put out by Quiltmaker Jan/Feb 2006 for this one. 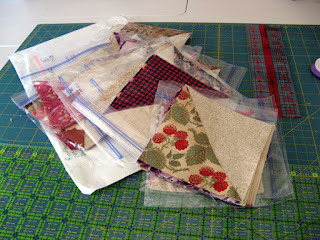 Saturday brought Connie's HSTs. 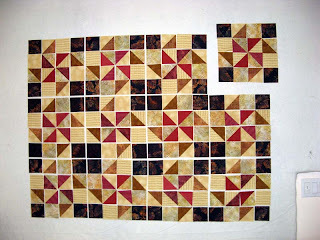 I really like the rich colors she used in her blocks. Everyone is beating the due date...just a few more to receive before I can sort them all out and send them back. So for this week I have two stats to change. Not a bad week...how was yours? Kloudburst is coming along nicely. 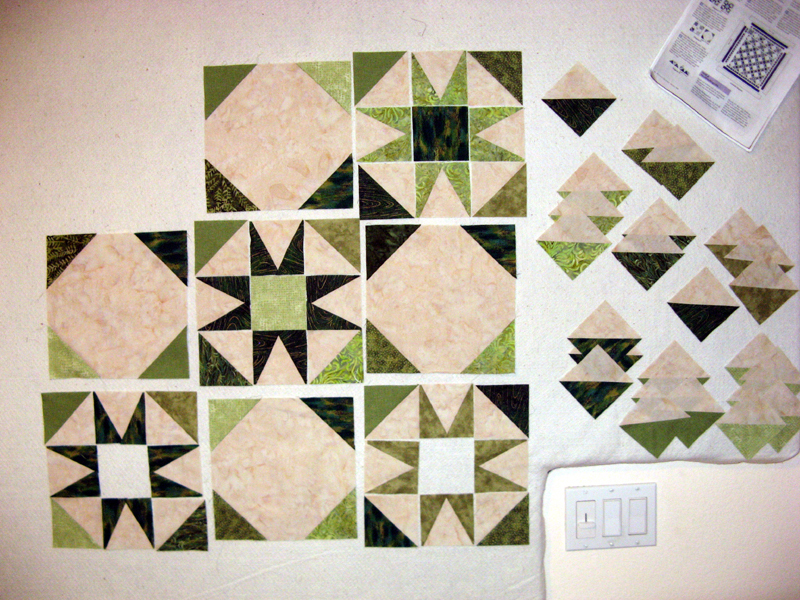 I completed the blocks and layout Thursday night and started Friday sewing the rows together. 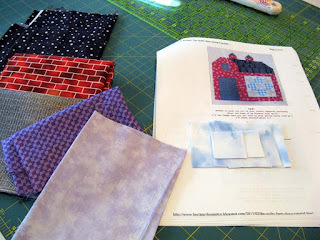 After swimming around in my stash looking for enough violet reds for a simple 1 1/2" inner border that you'd think I could find...it became obvious a trip to a LQS was necessary. I went to Beverly's where 1/2 yard was purchased. It reads solid which seemed appropriate since it will be sitting next to the dark navy/gold plaid of the setting blocks and the various gold strips in the piano key outer border. 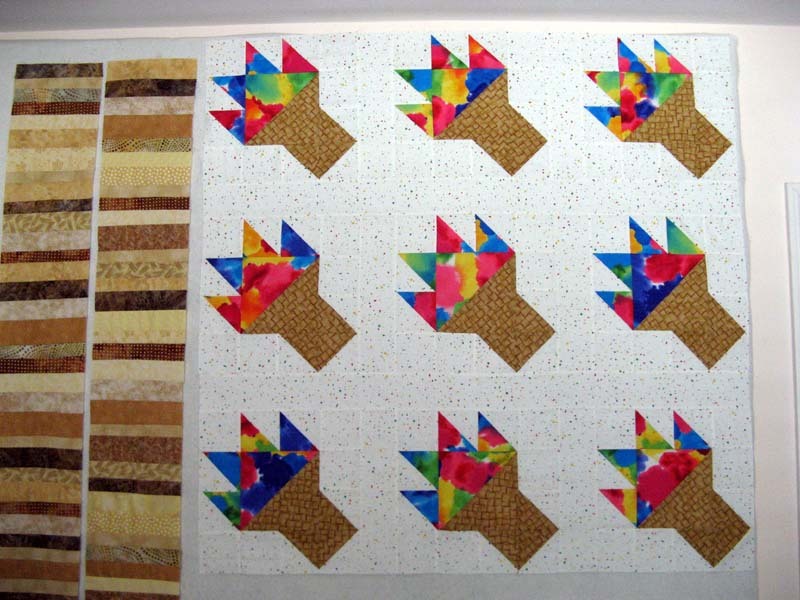 Thursday night also got me through the sashing of ice cream quilt #1. 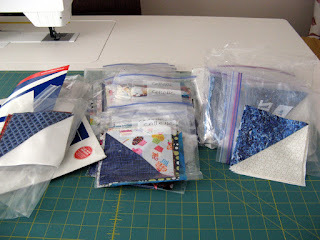 Still need to dive into my stash for an outer border. I'm pretty certain I'll have something that will work for the 3 1/2" wide strips needed. This quilt isn't quite as specific as Kloudburst need to be. Of course there is still fuel in the tank...=^.^=! I worked on Kloudburst's piano key borders Friday. I have what I need for three sides done now. I have some strip cutting to do before the fourth side can be put together. Friday brought me three more swappers HSTs. Including today nine days until they are due. I have just over half of them already lining my guest bathroom's tub (hey it's a great place to store things...heehee). These HSTs are from Theresa, Cathy, and Joan S. Theresa...this one on the top is definitely one I'll keep... Everyone will be pleased with the "building block" swap blocks. I'll be anxious to hear what projects will be made with your swap. Until tomorrow, happy a wonderful day! I've got trimming, binding, and a label to prepare. 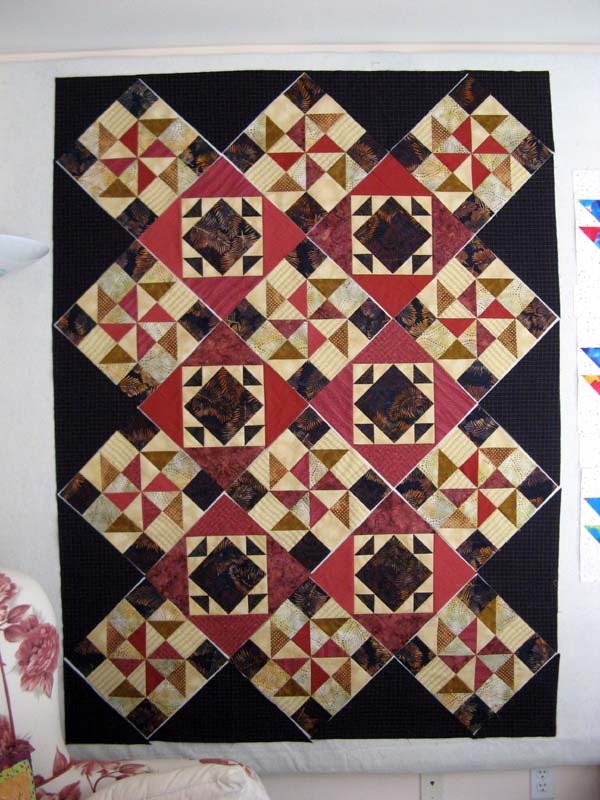 I'll try to get a closeup of the quilting...it is great. I'm so happy with how Khambray turned out. Last night I cut out one of the two ice cream quilts. Today I'll be sewing these blocks together. 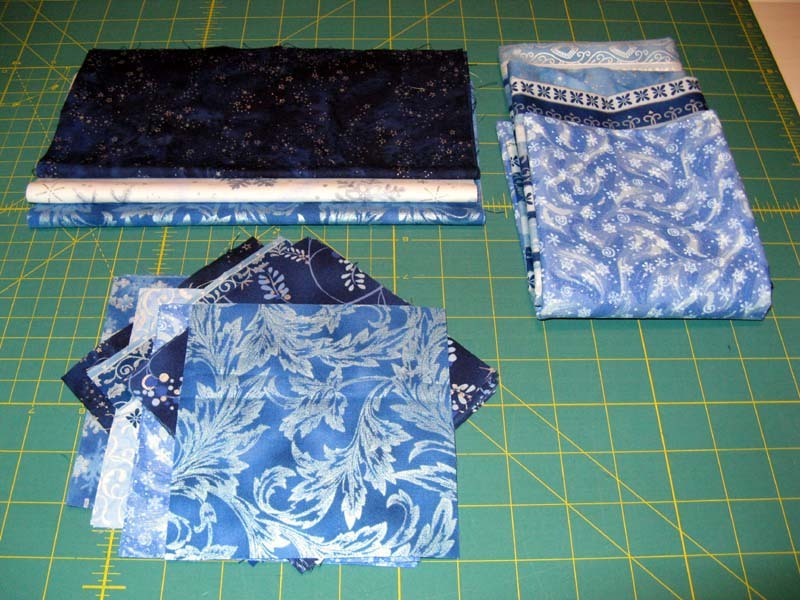 I'd hoped to have enough background to use for the outside borders, but my fabric ran out... It will be back to my stash to find something else! Hope your Thursday brings everything you want it to. 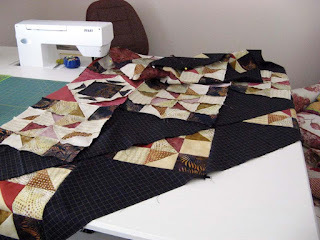 Maybe there will be time in your sewing room like I'm planning for mine. 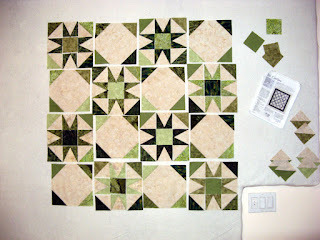 Half Square Triangle UPDATE! These just received from Debbie and Jennifer. Beautiful job ladies. That due date just keeps getting closer. Let me see...I can almost get all the days on my fingers...T minus 11 days and counting...Tic Toc Tic Toc! 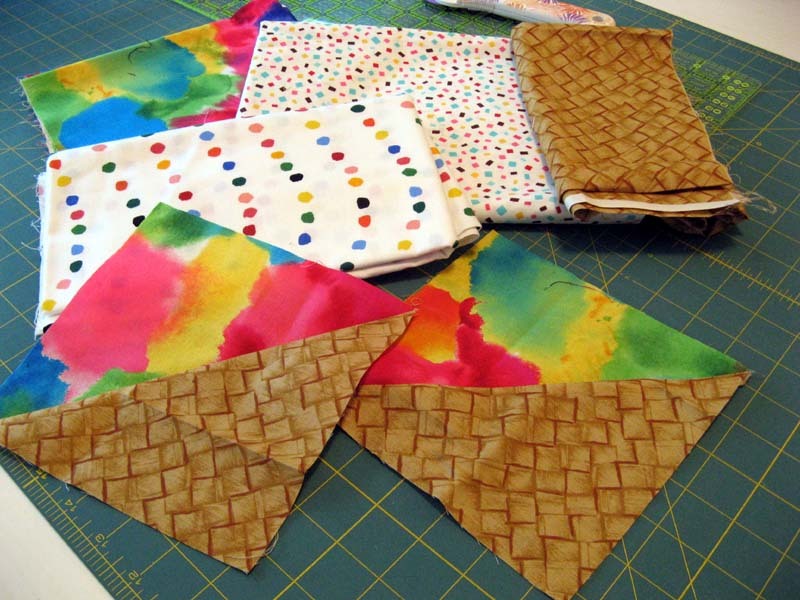 I'll be working on Ice Cream Quilts tonight for the 1st/2nd graders at Moore, OK. What do you have planned? I started with a list on Saturday of things that I needed to complete over the weekend. The barn was one of them. I like the way it turned out. 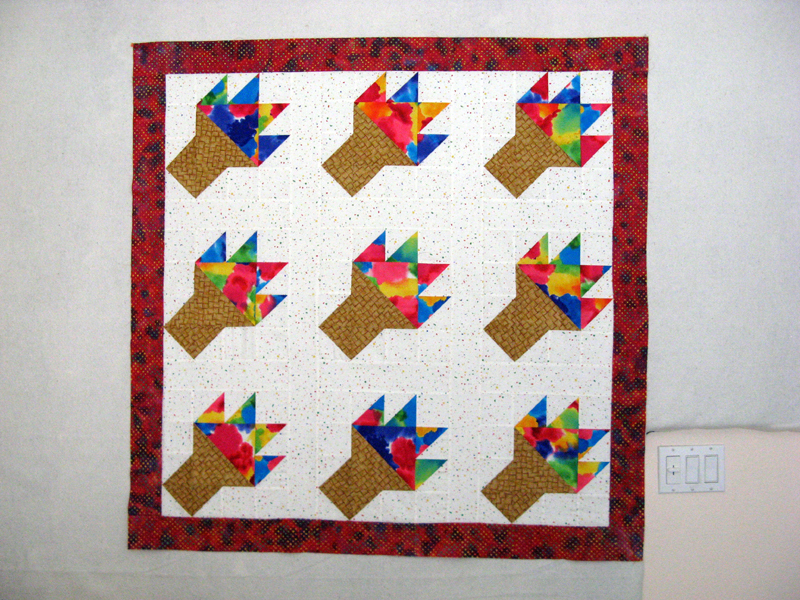 The sky fabric was provided by Jennifer who coordinated the Sunshine Quilt Guild BOM for this month. Can't wait to see on Tuesday all the barns that will be turned in and hopefully I'll be the lucky winner! 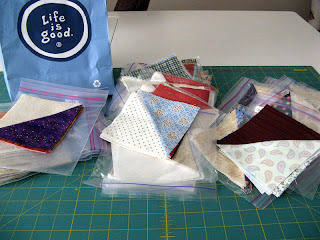 I also got the fabrics cut and assembled for the auction that takes place on Tuesday evening. Kerry will be adding to this item as well. I also worked on my June 2013 UFO. Assembling the A and B blocks right now. Need some time in the sewing room and these will be done in no time. 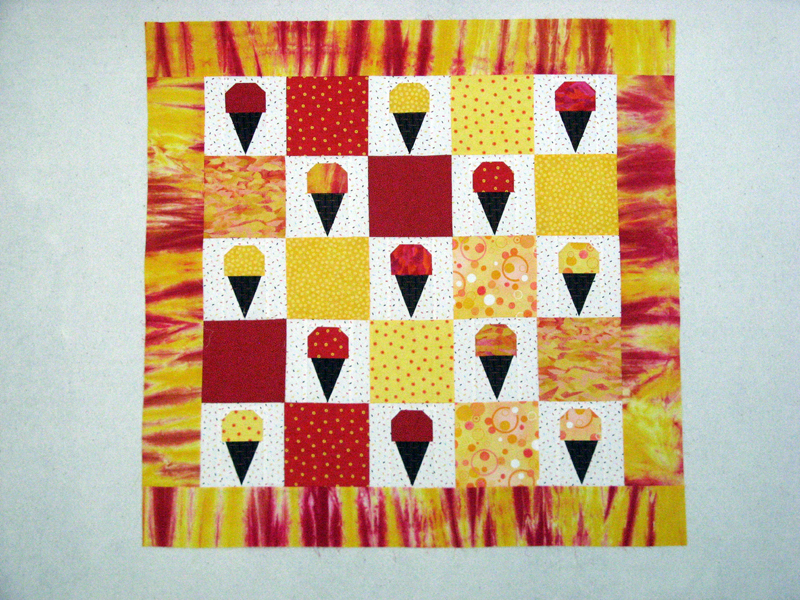 Other items on the list from Saturday included writing instructions for the ice cream quilt. I have them written, taking a bit of time to proof them out before sending them off. 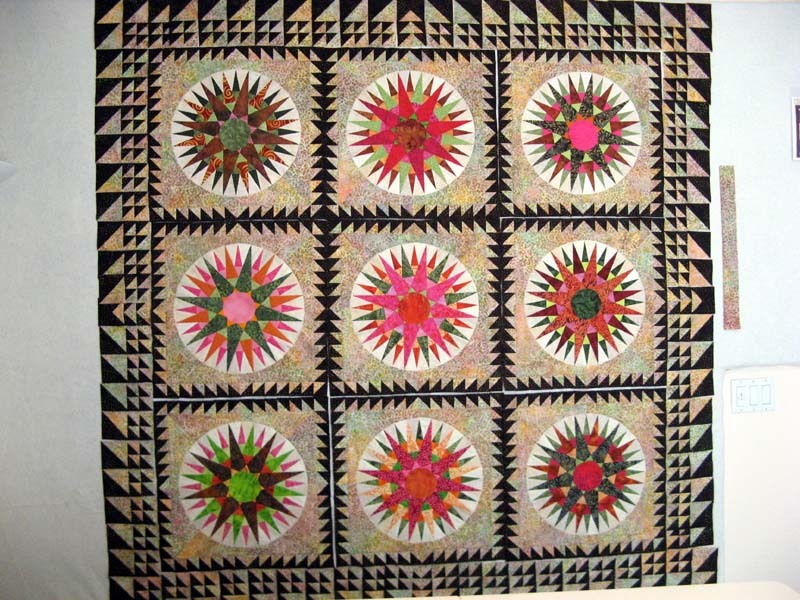 I didn't get to the entries for the San Diego Quilt Show. 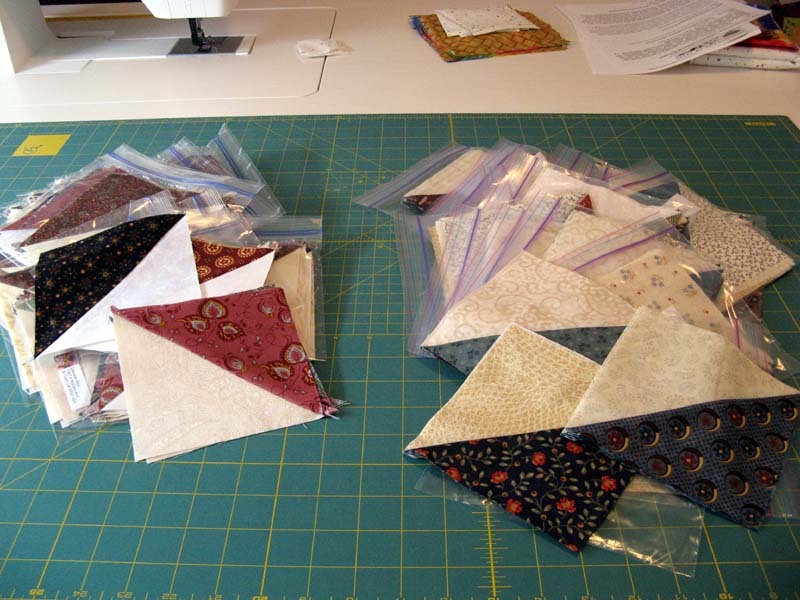 I also didn't get to pulling fabrics for the San Diego Humane Society's Fur Ball quilt project. I did get a few things I didn't list on Saturday so I'm pretty satisified with the weekend. There is always tomorrow...deadlines are still way within reach! 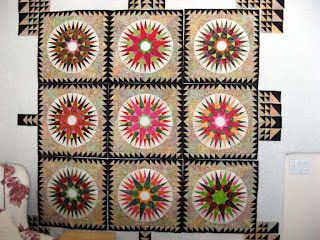 Check out other quilters inspiring Design Walls today at Patchwork Times. In the meantime there's June 2013 UFO to get busy with. I spent time Saturday getting the A Blocks assembled. There are 12 of them. 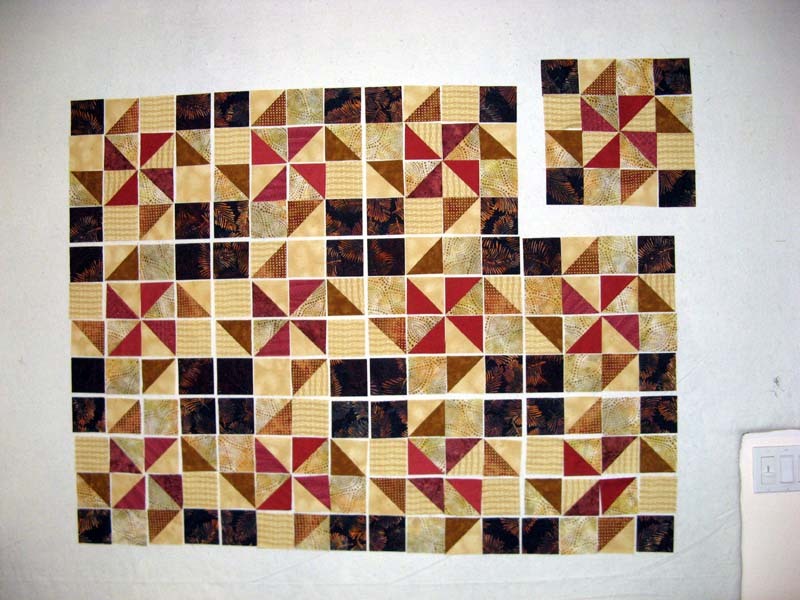 I'm using three different backgrounds (the lighter golds), the darker golds and the reds for the pattern that is created in the design and finally the dark blue print for the corners. The B Block brings back into the project more of the dark blue and the background. Each of the B Blocks will be identical. Come back tomorrow for a glimpse of my Design Wall with progress on Kloudburst. Today I will be working on Kloudburst. 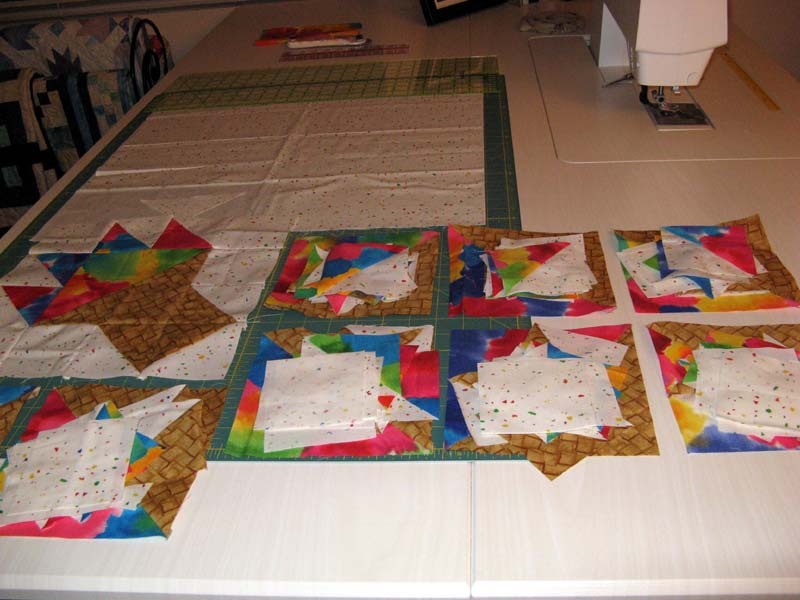 Assembly of Block A. I have the HSTs made and trimmed. Now comes the time to lay out each block to make sure I have the fabrics distributed well. This is the second time consuming part of scrap quilt projects. The first by far being the selection of fabrics from ones stash. 1) Ready my entries for the 2013 San Diego Quilt Show. Entry Deadline is July 1 which is quickly approaching. I am planning at least three this year perhaps four. 2 and 3) Assemble Sunshine Quilt Guilds BOM. Assemble an auction item for Sunshine Quilt Guilds June Auction. Deadline is Monday evening for me to have it by Tuesday's meeting. 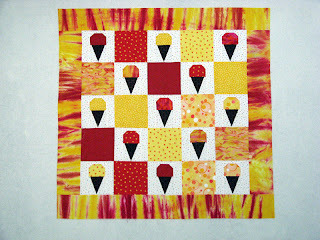 4) Write up directions for an Ice Cream quilt. Send to Mom. 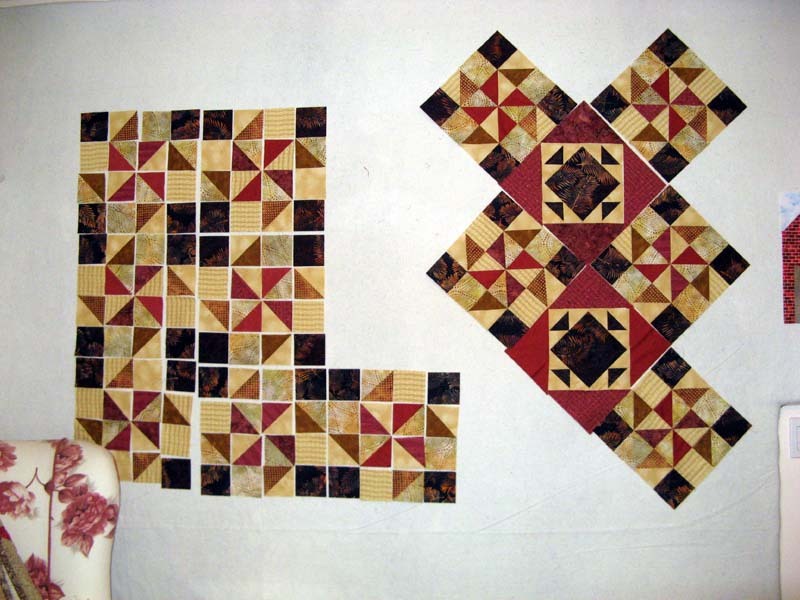 Share this project with others so they can be assured to get enough quilts for the kids. If you want further information you can contact Sue Crate at 802-299-1586. 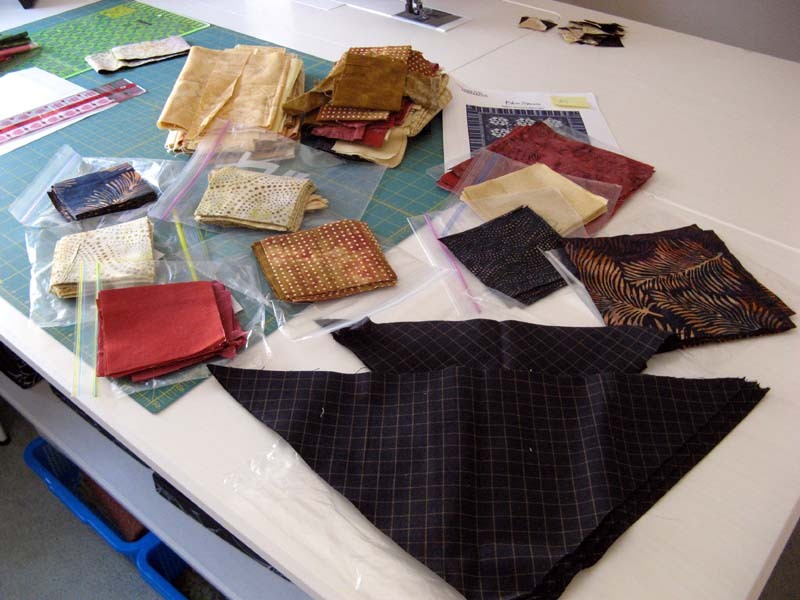 5) Gather fabrics for the San Diego Humane Society's Fur Ball. Well that's enough to keep me busy for awhile. Enjoy your Saturday! Here is Kwitcherbitchin all finished. 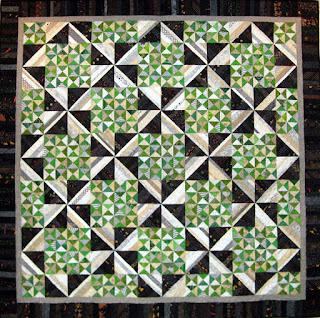 The green HSTs with the gray/neutral and black/brown string blocks looks terrific! 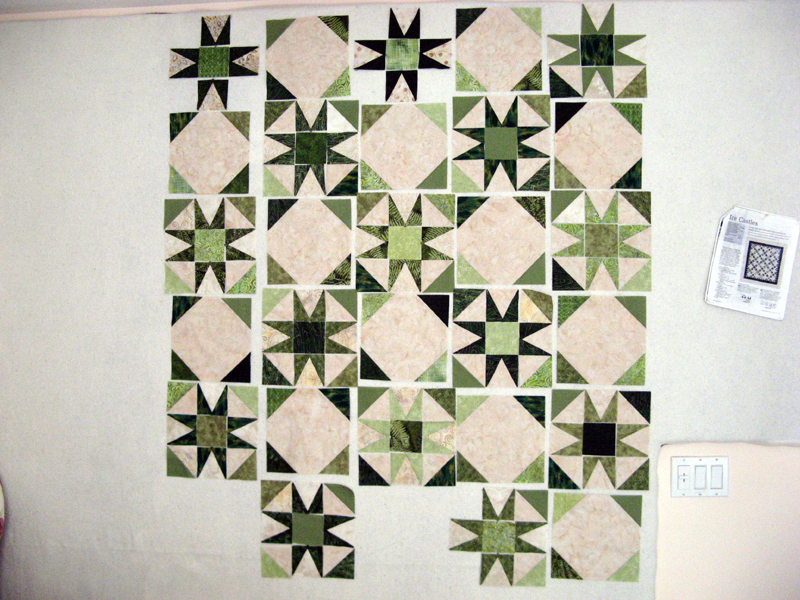 Thanks Mom for you oops on the gray/neutral string blocks! 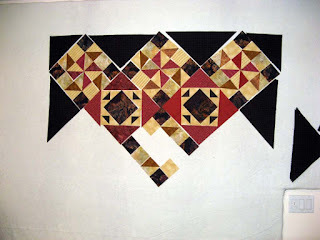 This Bonnie Hunter design Pfefferneuse from her String Fling book is a keeper... You did hear that Bonnie has another book coming out early next year? Wonder what wonderful designs she'll give us next. On to my June 2013 UFO Kloudburst. Oh I'm still working on appliqueing the centers on the nine compasses of Koriander Kompass. 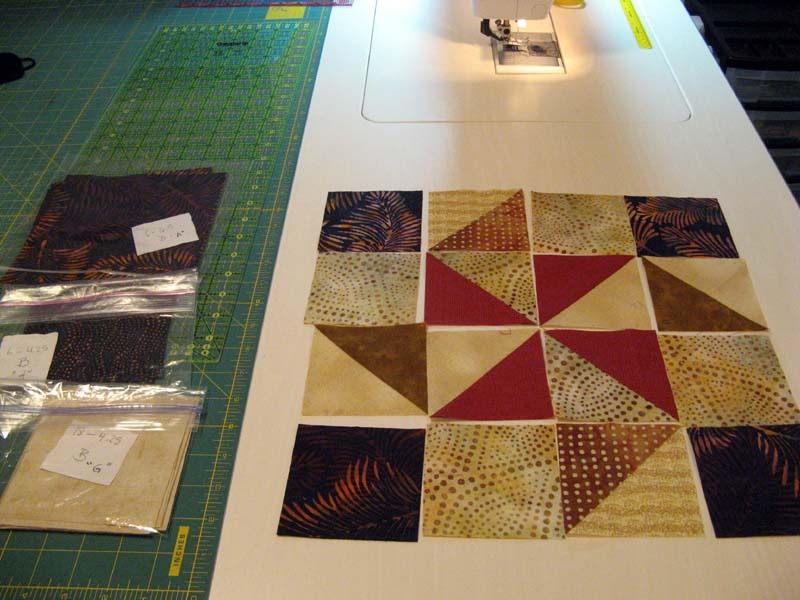 More on both of these projects as the week progresses. PJ Thursday can't come quick enough! I've gotten Kwitcherbitchin to the hand sewing part. 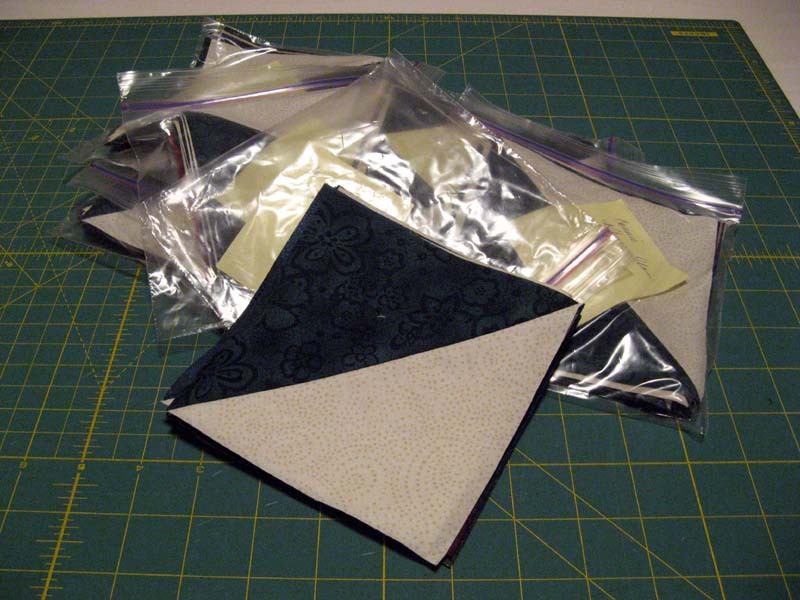 Working with black binding requires daylight! I'll be working on it a bit later today when I get home from work. Lunchtime will be spent appliqueing compass centers. Hope you are working on something fun this week. See more projects through the links at Patchwork Times. Kwitcherbitchin is in line for binding. I'll have this done sometime today along with working on Koriander Kompass. 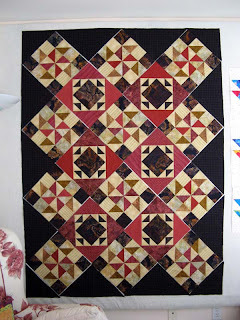 Due to the center fabric colors I moved some of the blocks around again. 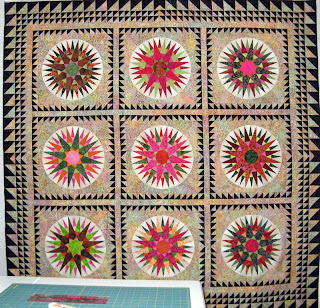 The dark blocks are still in the corners; it is the pinks that I moved a bit. So how do all these centers look? I have 28 more background units to make. 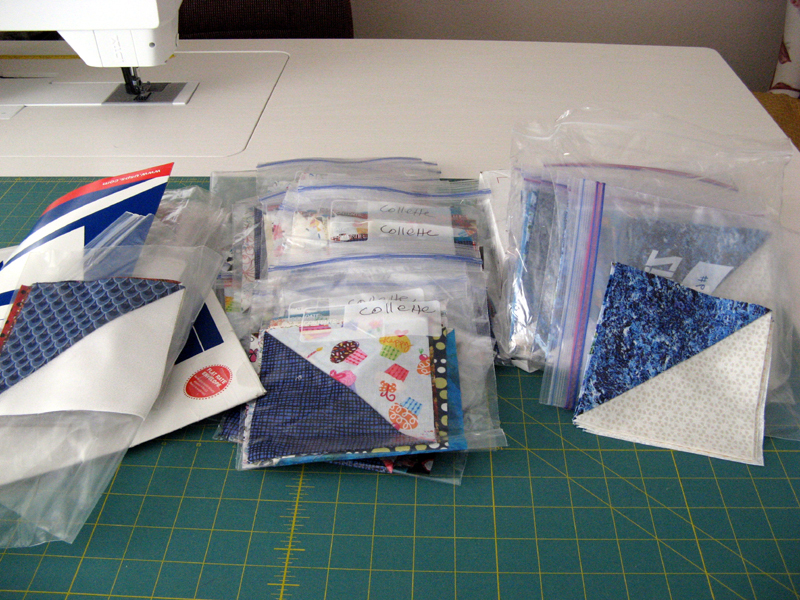 I have most of what I need cut out; time for sewing them together. Chore day should give me enough sewing time. Monday should be ready to start assembling June 2013 UFO #9 Kloudburst. I have nothing to report this week either purchase or used. Next week looks pretty good for yardage from Koriander Kompass. 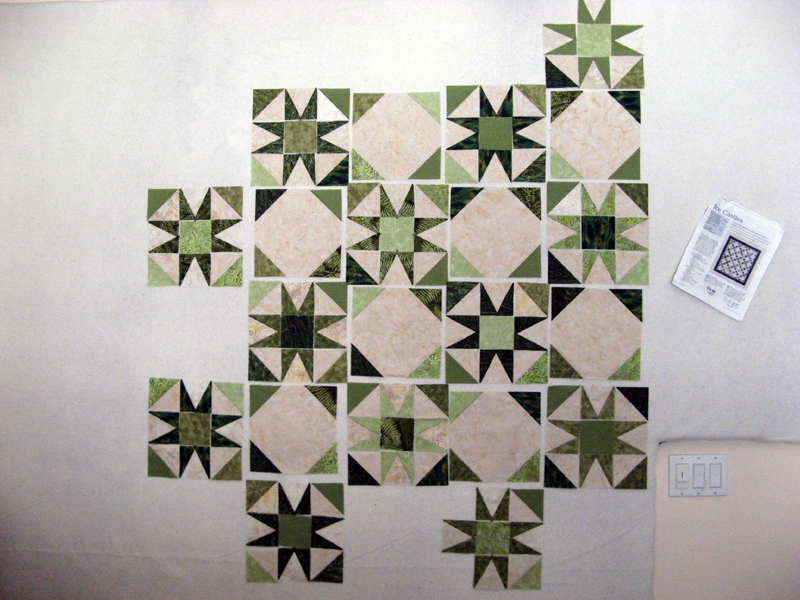 Kerry has March 2013 UFO #1 Khambray next up for quilting. If you are interested in seeing either of these two 2013 UFO projects check out my 2013 UFO Page. 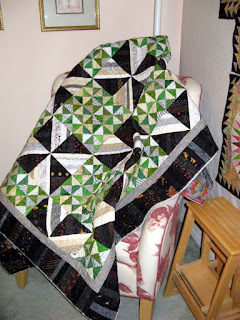 Did you see the Thirteen in '13 UFO Parade Aunt Marti has on her blog 52Quilts.com? There were a bunch of us who finished May's challenge. Next number selected is #9 that for me is Kloudburst. I have my project all cut out and ready for assembly. Sure makes the going quicker to have that time consuming step out of the way. Actually the biggest step for me is the selection of fabrics from my stash...making them work AND having enough fabric on what you finally choose. I am positive all of you scrap quilters understand this all to well =^.^= For more information on my Kloudburst project you can check here. Kerry finished the quilting of my Kwitcherbitchin quilt yesterday. I will be anxious to get it trimmed up, sleeve prepared, binding prepared, sewed on, hand sewed down, and label in place. Kwitcherbitchin is a black, gray, neutral, and bright green Bonnie Hunter design called Pfefferneuse. (Pattern is in her String Fling book.) I have two guild meetings just two weeks away where I will be anxious to show her off. For you lucky followers though there won't be two weeks to wait! Have a great Saturday, hope there is something fun planned for your day.